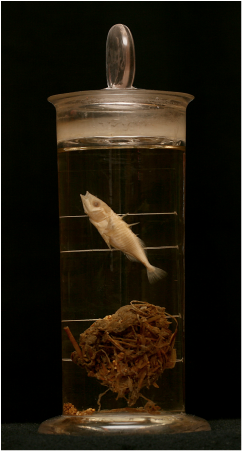 The Alfred Denny collection showcases all major taxonomic groups. Due to the vast collection, many items cannot be displayed in the museum, including two letters written by Charles Darwin to Henry Denny (Alfred's father), but look out for some specimens you can see en route to the museum. 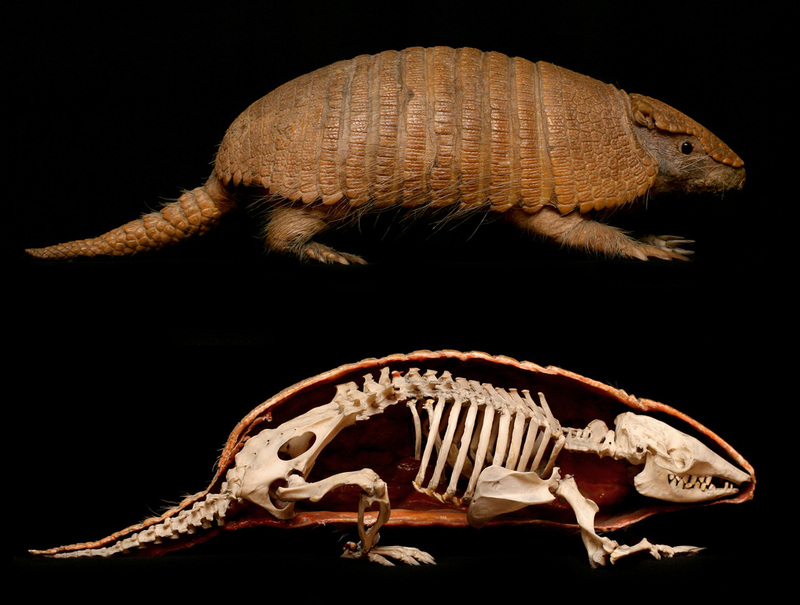 These are any animal that lacks a vertebral column, or backbone. Invertebrates account for more than 90 percent of all living animals, and range in size from minute protozoans to giant squids. Although generally soft-bodied, that is they lack an internal rigid skeleton, they often have a hard outer skeleton (as in most molluscs, crustaceans and insects) that serves, as well, for body protection. 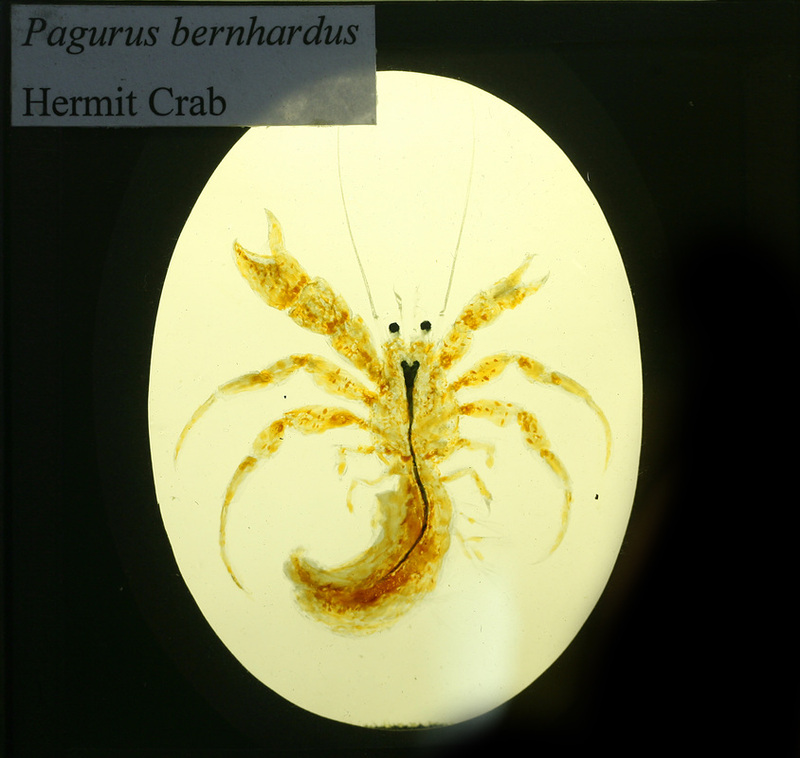 The museum includes examples from all the major invertebrate phyla, many of which are preserved in alcohol. Highlights include the intricate glass skeletons of Venus’ flower baskets - a marine sponge; colourful corals; venomous jelly fish; deep sea beard worms - the same as those that naturally occur 10,000 metres under water around deep sea hydrothermal vents; leeches used in medicine; casts of trilobite fossils; camouflaged stick insects; pinned silk moths; an extensive collection of hymenoptera (ants and wasps) collected from Colchester (U.K.); and well-preserved collections of decorative caterpillars. Fish are cold-blooded vertebrates found in the world’s fresh and salt waters. Their bodies are generally fusiform (tapered to each end) with paired fins and covered by skin adorned with either bony or toothlike (placoid) scales. Respiration is generally through gills. Most fish also have a swim bladder, a gas-filled organ used to adjust swimming depth. The museum houses a range of living species, from the primitive, jawless lampreys and hagfishes through the cartilaginous sharks, skates and rays to the abundant and diverse bony fishes. The collection also includes a number of fossils and casts of the prehistoric fish that lived in the sea during the Devonian period (415-360 million years ago), a period best known for its abundance and diversity of fish. These are cold-blooded vertebrates that are midway in evolutionary development between fishes and reptiles. Amphibians have permeable skin through which oxygen from both air and water can pass. Living amphibians include frogs and toads; salamanders and newts; and caecilians. Most amphibians have an aquatic larval, or tadpole, stage that metamorphoses into a terrestrial adult. Amphibians were the first vertebrates to move from an aquatic environment to land, and they are the ancestors of all reptiles, birds and mammals. 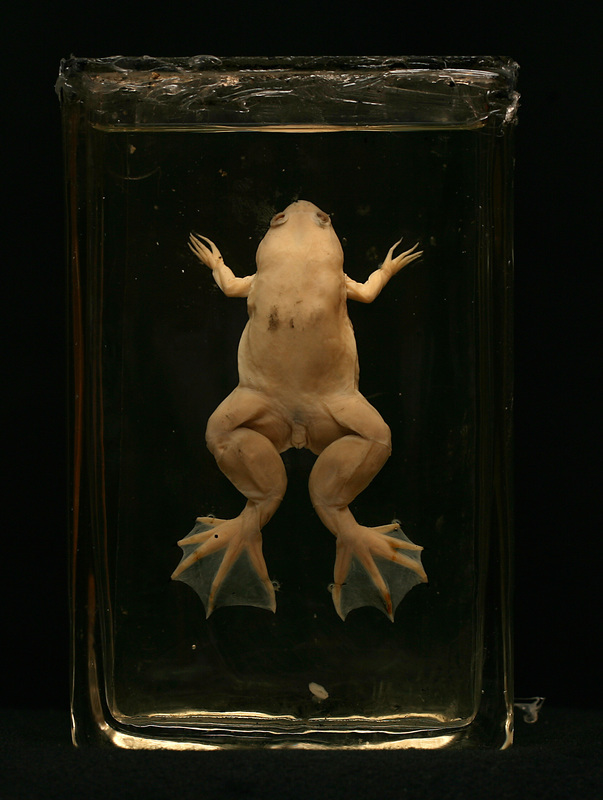 The collection includes a rare Japanese giant salamander – the largest salamander species in the world; the skeleton of a caecilian – an unusual specimen as these creatures are notoriously elusive; American bullfrogs – the largest frog species in the world and a troublesome invasive species worldwide; and an African clawed frog - the movement of this latter species has contributed to the spread of a chytrid fungus which causes chytridiomycosis, a disease fatal to many different amphibians and causing dramatic declines. Reptiles are cold-blooded, air-breathing vertebrates covered in a scaly skin which is characteristically dry and has few or no glands. 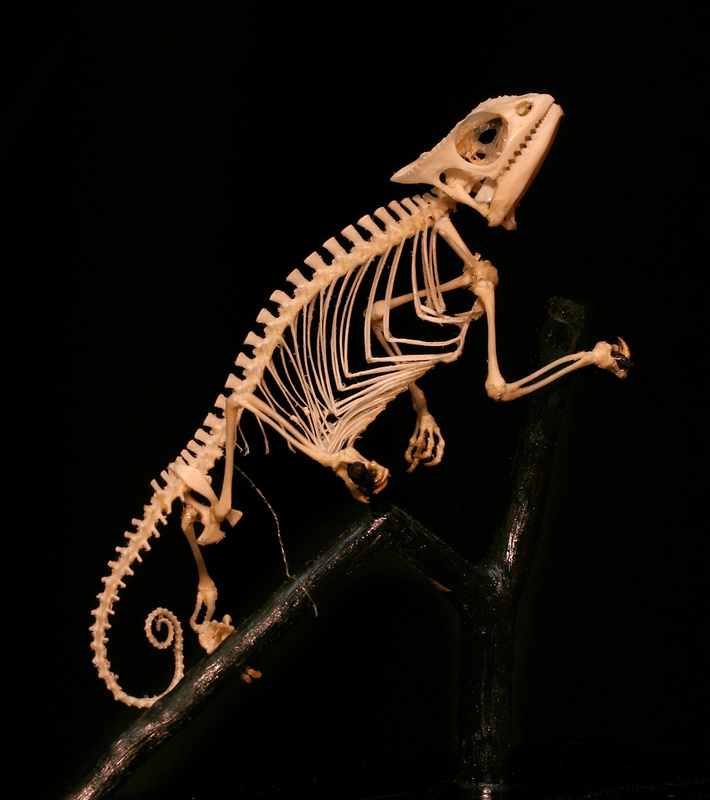 Living reptiles include snakes, crocodiles, lizards, turtles and tuatara. Except for snakes, reptiles have four limbs, which project to the side. This causes both lateral and forward thrusts when the animal walks. Reptiles occupy an intermediate position in evolutionary development between the amphibians and the birds and mammals. The museum includes examples from all the living reptile groups and fossils from extinct reptiles that roamed the earth alongside the dinosaurs, including ichthyosaurs – marine reptiles that resemble dolphins, and pterosaurs – flying reptiles known as pterodactyls. The casts of fossilised pterodactyls in the museum were originally discovered in the Solnhofen limestone in Bavaria, Germany. Study of the fossils reveals an interesting adaptation, that the pterodactyl’s wings were formed by a skin and muscle membrane that stretched between its little finger to its hind limbs. These are warm-blooded vertebrates with bodies covered in feathers made of keratin, and forelimbs modified into wings. Other characteristics of birds include feet covered in scales, vestigial claws on wing tips, a bill covered in keratin, and an oil gland for dressing the plumage. 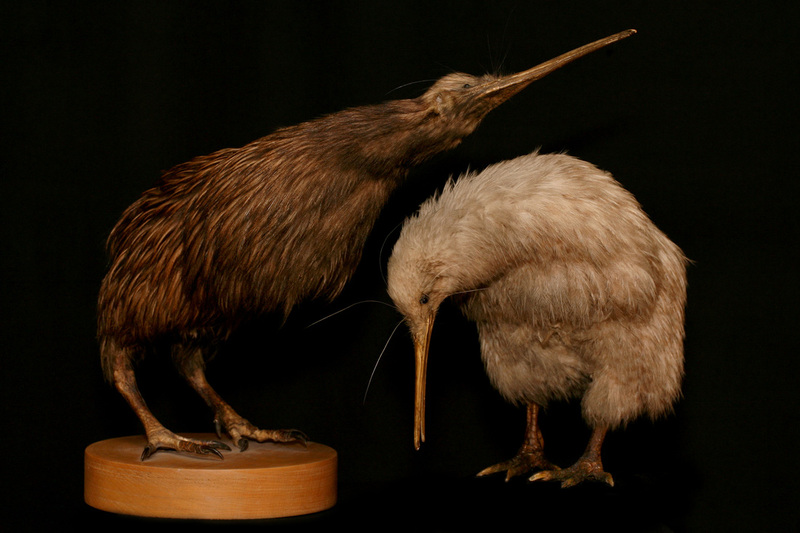 The museum collection includes an emperor penguin collected during Scott’s Arctic expedition (1901-1904) which greets visitors at the entrance to the Alfred Denny building; a 3-metre tall ostrich skeleton; and a life-sized model of an elephant bird’s egg. Extinct since the 17th century, the elephant bird, along with its close cousin, the Moa, is the largest bird to have ever roamed the earth, and produced eggs that were 160 times larger than a chicken egg. Mammals are vertebrates in which the young are nourished with milk secreted by special glands (mammae) of the mother. All mammals possess hair at some point in life, are warm-blooded and four-limbed (except in some aquatic varieties). Mammals are an extremely diverse group, ranging in size from the largest animal that has ever lived, the 150-ton blue whale, to shrews that weigh only a few grams. There are representatives from all 14 living orders of mammals in the museum including: the skulls of an Asian and an African elephant which allows for intriguing morphological comparison; the skeleton of a manatee; fully articulated skeletons of a range of monkeys and apes including a human; dissections provide a rare glimpse of developing embryos inside the pouch of a marsupial (pouched mammal) compared to inside the uterus of an eutherian (placental mammal); and impressive hunting trophies of hoofed animals including a caribou and a moose. These trophies were collected when big game hunting was popular, as emblems of human vigour and superiority. Fortunately, this ‘sport’ has declined as awareness of conservation and species extinction has increased. These heads portray the beauty of these animals and serve as a reminder of our history.